If your garage door breaks down unexpectedly, we want you to know that it's possible to get it fixed sooner rather than later. We provide a wide range of both scheduled and emergency repair services and our company understands that homeowners need a quick response to get their door working again as soon as possible. A garage door is a complex system, and it might not always be obvious what's wrong with it. Our technicians can quickly diagnoses the problem and perform all the necessary repairs. Whether you've got a problem with your tracks, a burnt electrical wire or need to replace your springs, we don’t just get your door working again – we'll make sure it’ll keep working reliably for a long time to come. When one part of a garage door fails it can cause damage to other components; they may start to overcompensate, leading to subtle damage that isn’t always evident at a glance. When our technicians inspect a broken door they take the time to assess whether any additional damage has been caused. This lets us carry out repairs that will prevent future failures. We understand that our customers need their doors to be working again as quickly as possible. We always do our best to resolve problems as fast as we can, and we’re committed to making sure each customer’s garage door receives top-quality professional treatment. One of the leading causes of garage door problems is worn and damaged components. When parts, such as the springs, wear out to the point of total failure, they often need to be replaced. Our technicians keep the best modern parts on the market in stock, and we're never without the perfect component at hand when on the spot replacement is required. If your door has suffered a malfunction, or requires professional attention, reach out to our experts at Garage Door Repair Highland Park today. 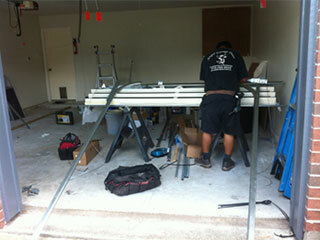 We can fix any problem with your door and will provide you with valuable advice for maintaining it in the future. Call us today.